Greenwich Balls - Gary Ling, Digital Producer, Data Monetiser, Political Savant, Information Economist, Solution Seller, Business Strategist. 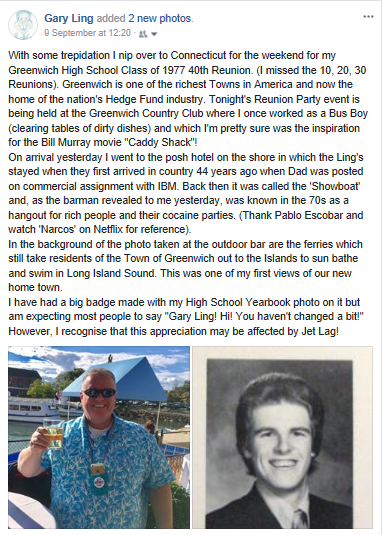 Posted 14Sept17: I return home to Blighty on the Redeye after a long weekend in Greenwich, Connecticut, USA, attending the 40th Reunion of my High School Class of 1977 and share three notable personal learnings from the experience. First, I hate to say it but stats really do rule my world. In fact, I only seem to get emotional when I see stats. I felt tired and emotional when the Class President (who was also the High School star running back so at least we got that vote right!) 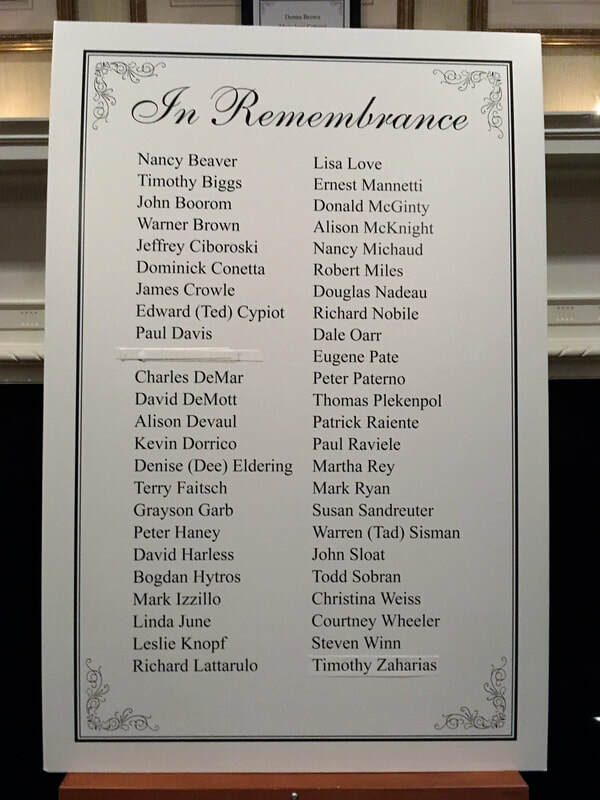 started the evening speaking on the stage going through a list of people from the Class who had died. I've got to say that upon reflection while this was the right thing to do it definitely put a downer on the night, especially when one of the people I was hoping to catch up with appeared on the list. Ernie Mannetti you were The Man mate, and I will never forget you. So 53 people out of 900+ died in the last 40 years. I know there is some statistical work here to discover just how deviant from the norm we all are. On the happy side of the feely balance sheet (see, I do know ‘emotional terms’) it was a delightful revelation to me that in 1977 the size of GHS graduating class was the biggest that year in the whole of the United States of America! All 50 states. Howz about that? I appreciated my high school was huge but really, 953 (?) graduates. No wonder the Class Yearbook is such a weighty tome. Yo! That’s cool. Someone later said that we are also the biggest US graduating class ever. Baby Boomers Rule! Greenwich High School was a game changing experience for me. I made life long friends with lots of great people with a sense of humour. Second, I learned that I need to either binge drink more or not drink at all. My night at the prestigious Greenwich Country Club revealed that my army days of drinking copious amounts and then playing rugby with the regimental silver in the officers’ mess and appearing on the Parade Ground, bright-eyed and bushy-tailed for a 0700hrs reveille in front of my platoon are nothing more than a distant memory. Although to be fair, I can’t remember being offered a never-ending supply of Mojitos in the Officers Mess. I did some Pochine (think Kentucky Moonshine) a few times when serving in Northern Ireland which ranks up there somewhere I suppose. But it was as if the bar lady at this uber institution took pity on me in my droopy bow tie and had an already mixed one on standby every time I went for a refill. Then my Mr Mo-hee-toe afflicted gob spoke thus: “I love you with a passion.” I handed her my business card as I scurried off and never looked back! I still have a reasonable amount of my own hair, am pretty healthy (but obese), aren’t taking medication, have a strong jaw, am sociable and politically ‘sound’, reasonably affluent, well travelled, hard working, digitally astute, think rationally, plan ahead and am able to dance. In my expert opinion that puts me in the 10th percentile. Hell, it was worth nipping over to the east coast of America for the weekend just to assimilate this. Though I’m still coping with that Mojitos-induced hangover!